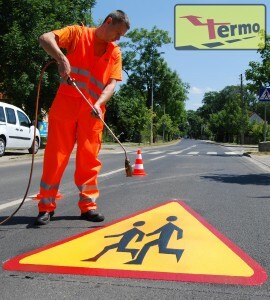 TERMOSIGN: ready-made thermoplastic markers used to mark roads, parking lots and other pavements. By using thermoplastics of varying compositions and thicknesses, our product can be adapted for use in any climate and location. TERMOSIGN markers are more durable than traditional surface markings and are applied without the use of special equipment or specialized workers. Thanks to our unique technology, we can guarantee high quality products. Results in shorter traffic interruptions during application. Custom pictograms as per client specification.